Williamsburg artist Catya Plate offered to meet me at her exhibit at the Center for Book Arts in Manhattan’s garment district. Along with other artists who use “actual thread as a design element to convey both content and form,” Plate was part of “Threads,” curated by Lois Morrison and Alexander Campos, the executive director of the Center. Plate’s science fiction clothespin people, (Clothespins, sweet young things, are what we all will be using when there is no longer natural gas or sufficient electricity to dry out clothes in dryers.) Plate’s creatures have become organ-specific personalities in the fractionalized distant future. Organs, or rather line drawings of them, are frequently sighted on the subway “runways” I frequent, mostly on standard issue T-shirts. On the street, in addition to the bag, I have seen hearts, bones, brains, and (I if I remember correctly) lungs. 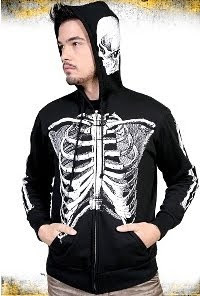 An example of this mass-market trend is this skeleton hoodie on the ThisNEXT Web site, reviewed by RopperShopper and a designed by A Fine Mess. (I couldn’t actually find this item in the HotTopic online store, but a lime green T-shirt with a hemisection of a skeletal torso attracted me and was much less tacky). Comments about the hoodie included concerns about whether garments signified belief in satanism, and the appropriateness of wearing one to church. There are haute couture manifestations of the trend as well. Rodarte (the Mulleavy sisters) and Alexander McQueen, in his “Dis-Tinction Un-Natural Selection” show have incorporated the iconic Halloween skeleton theme into runway shows. Last spring’s Rodarte skeleton dress is an astute (especially in the bone color) variation on the slashes and cut offs we’ve seen on the street. To my mind, it works because it is tactile. McQueen’s silvery piece is a kissing cousin to the A Fine Mess T shirt, with both relying on visual spectacle rather than focusing on dissection. In any event, expect more of this, now that Paris Hilton will debut as a musical film actor in Repo! The Genetic Opera, about repossession of mass marketed genetically modified organs. Let’s hope Plate’s identifying numbers turn out to be lifespans of her future beings in the far future, as she intended, not lot numbers as I first supposed. Although I veer toward the wear-it-as-if-you-mean-it school of fashion, this is one trend I hope stays an empty fashion statement, not a biopolitical future.